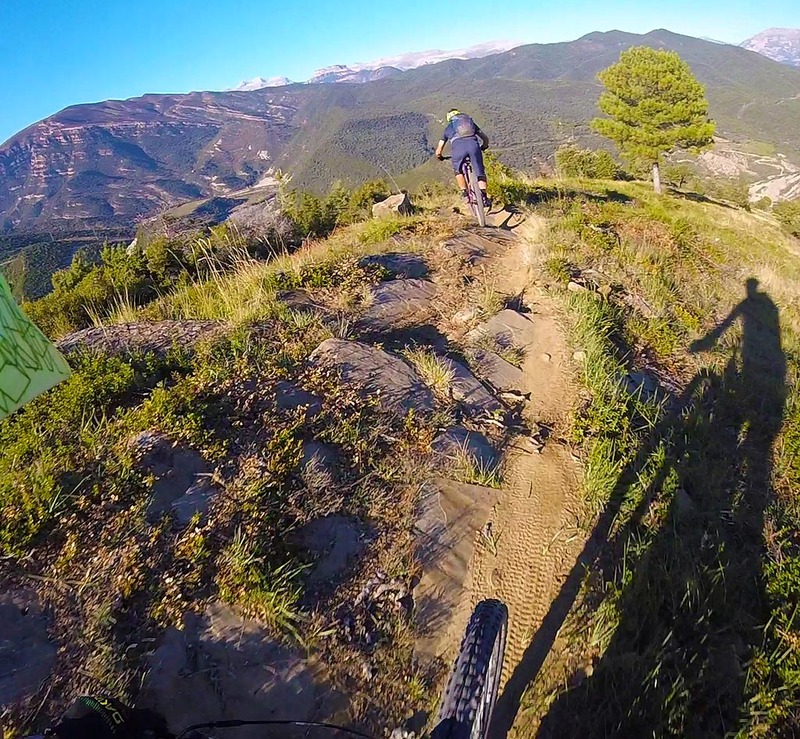 This is part two in a three-part series on mountain biking in the Spanish Pyrenees. You can read part one here. 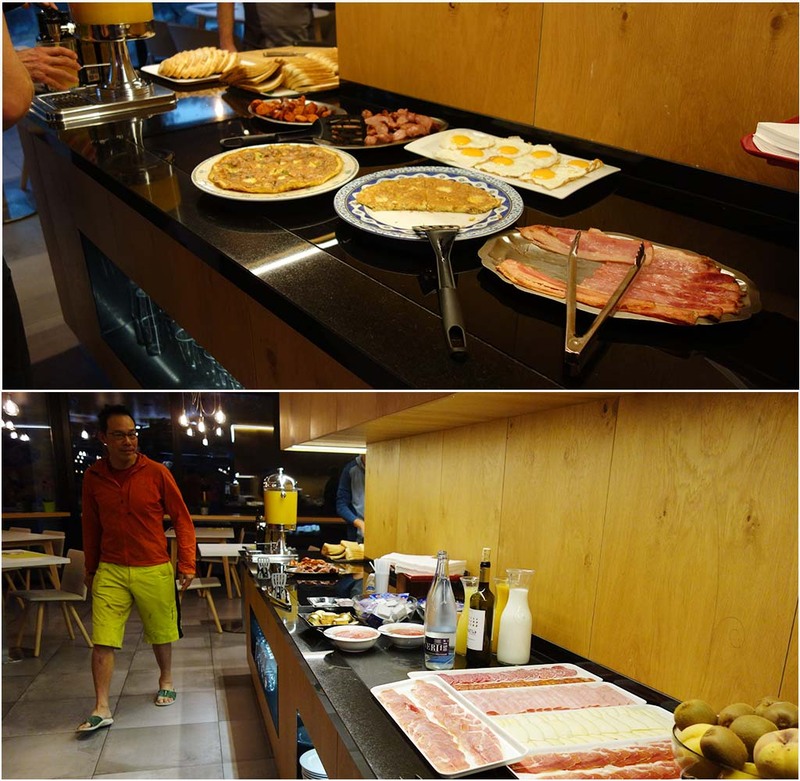 Another brisk fall day in Val Benasque meant getting up at 7 am for another massive breakfast. 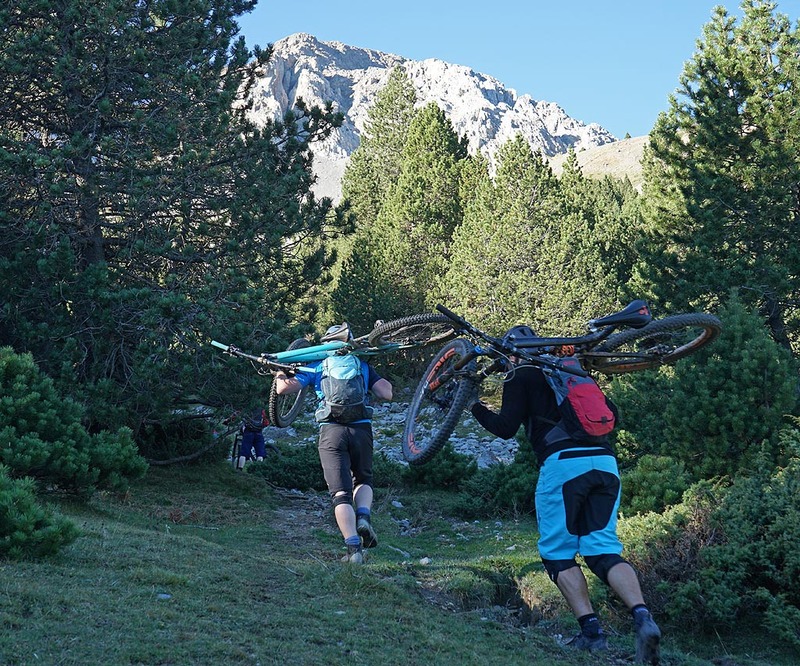 Fueled by food and excellent Spanish coffee we were ready for a day of Pyrenees alpine singletrack. 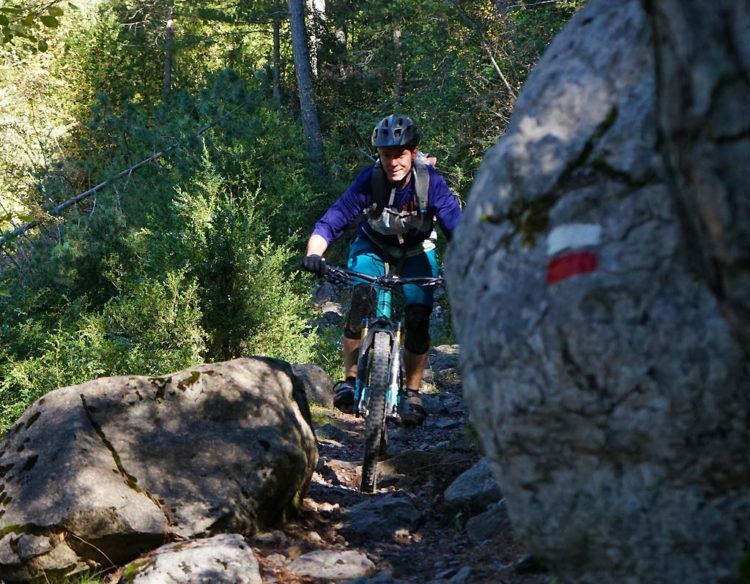 This time we were going for a pleasant ramble hike-a-biking via a series of trails and valleys. The climb was a bracing 560m (1800ft.) over a 2.9km distance. 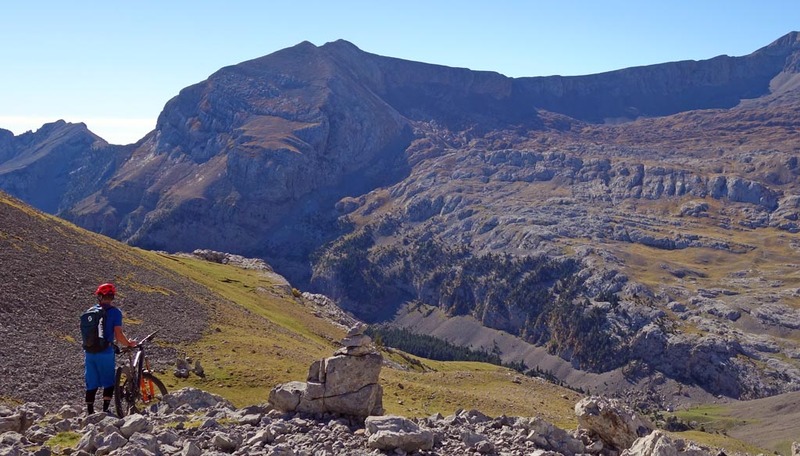 Most of that elevation was gained hiking from 1800m to a rugged alpine col at 2348m. 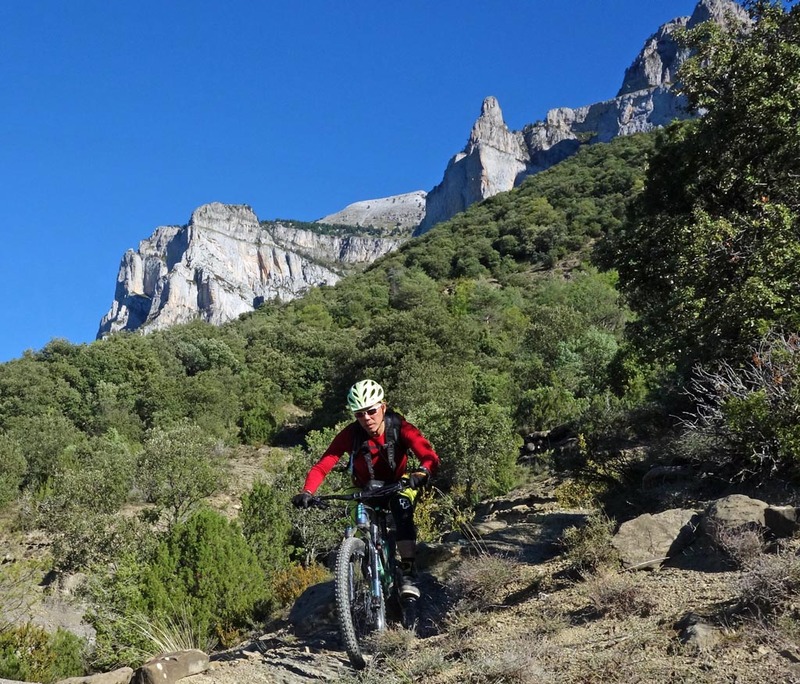 We then rode part of the Grand Ruta trail that ascends from southeast of the Cotiella limestone massif to the small town of Saravillo at 1020m. 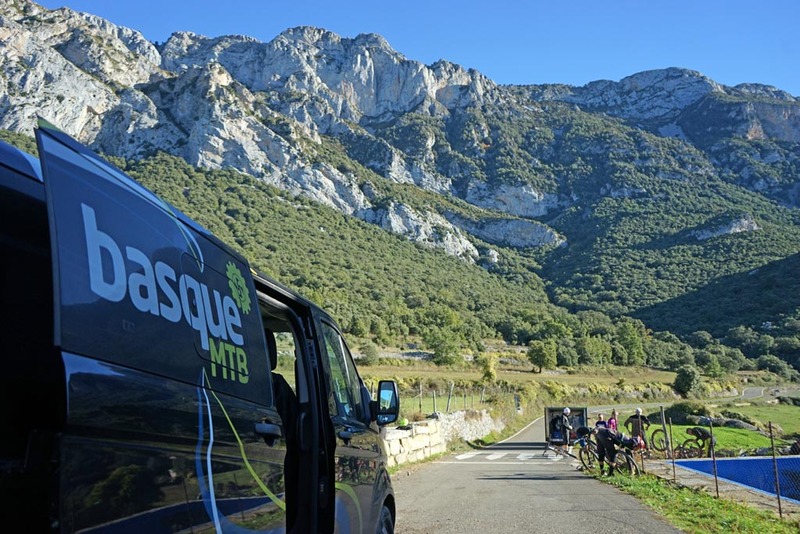 After a massive lunch we were transported to Ainsa where we rode the Coda Sarten, which is a former EWS stage. 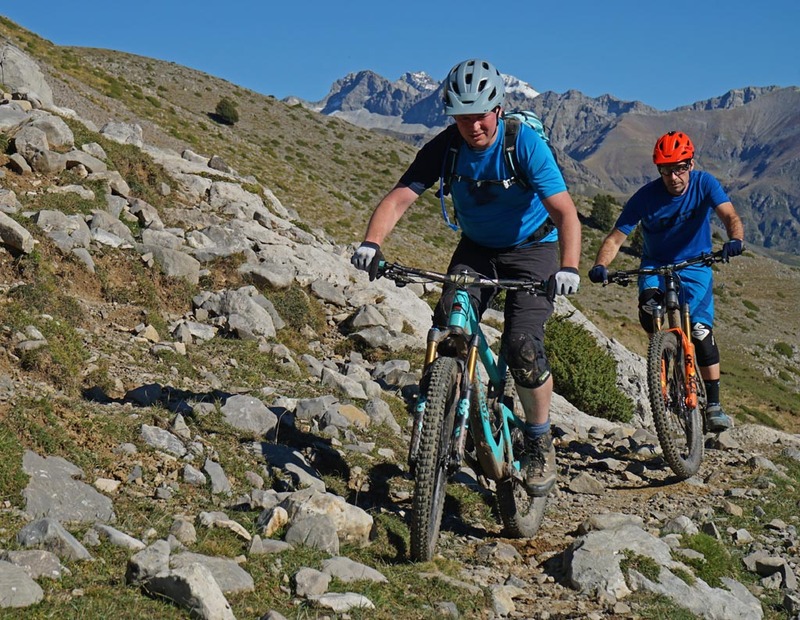 We were now settled into the expectations of good weather and once again, we were not disappointed. The day greeted us with sunshine and cool, morning air. 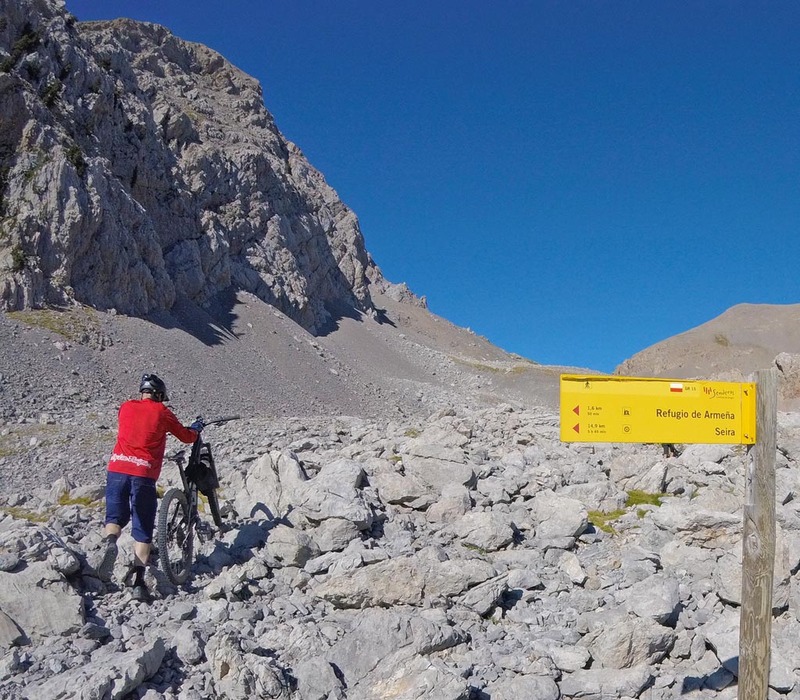 The riding temperatures were perfect for pedaling in the alpine. 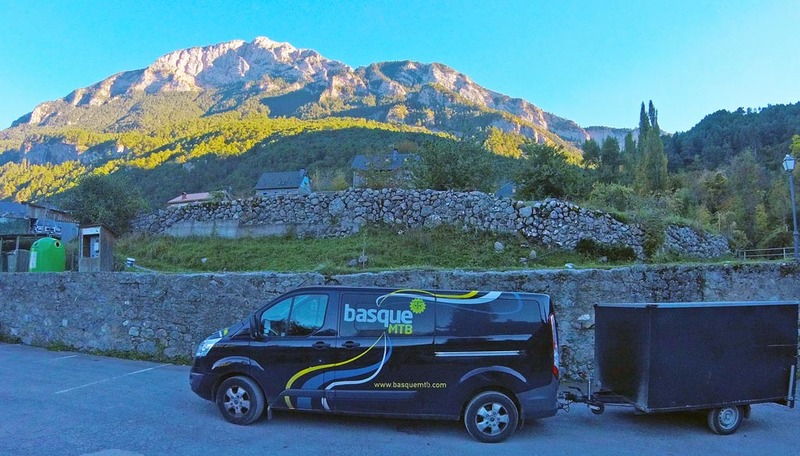 A local company, Basque de Novela, provided shuttle service. 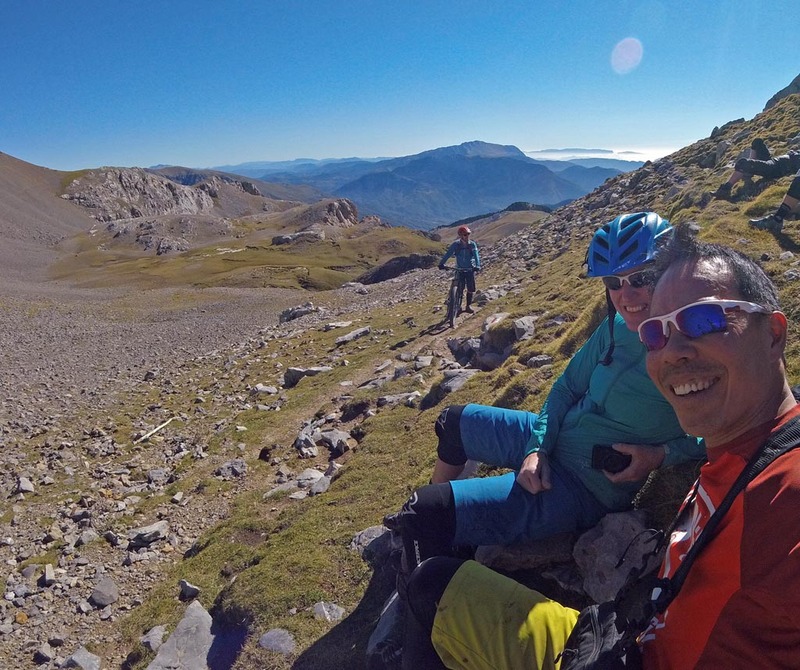 After a long winding drive from our hotel at Benasque, we were dropped off at approximately 1650m elevation, leaving a nice long hike to get to the pass below the Cotiella massif. 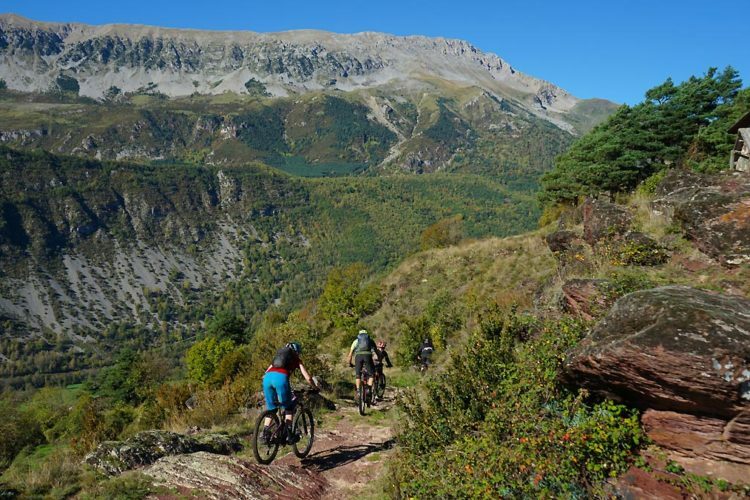 The group hiked and biked surrounded by gorgeous alpine vistas at a good steady pace. The limestone deposits of the Cotiella have eroded over time leaving behind karst, caves, and unusual topography. 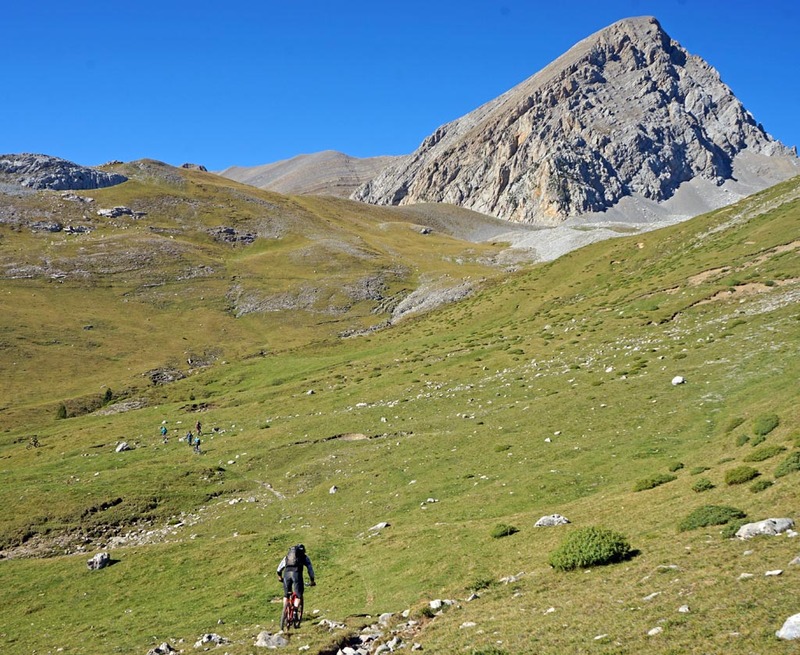 There are ridges, meadows, lakes, and thanks to the cool fall temperatures, no bugs! 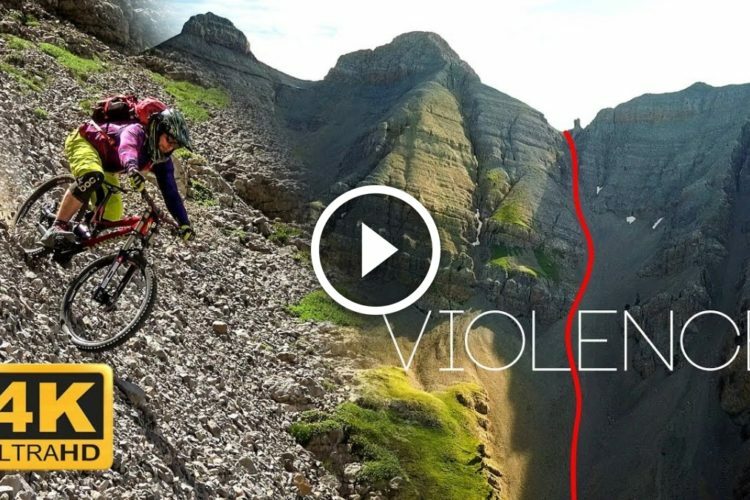 We rode part of this route. This was the high point at 2350m. We started the ride through a nice field. 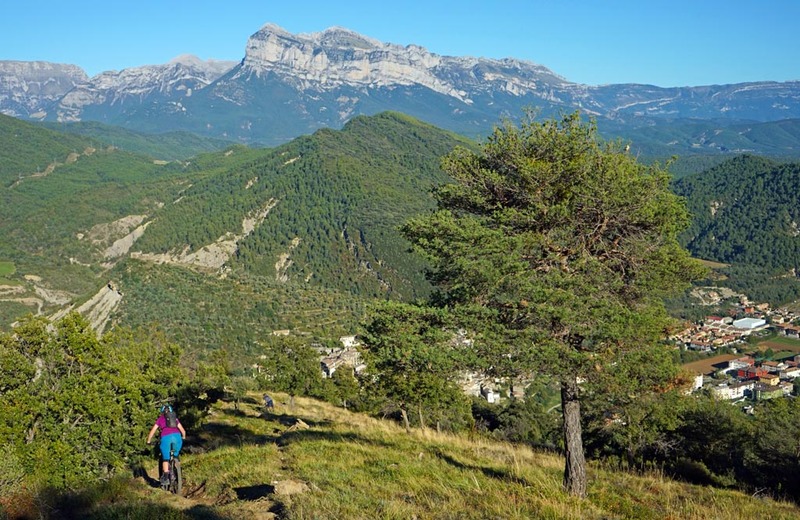 With steep pitches, we had to walk with the limestone karsts of the Cotiella looming above. Rob found a nice section to ride. So did Raymond. 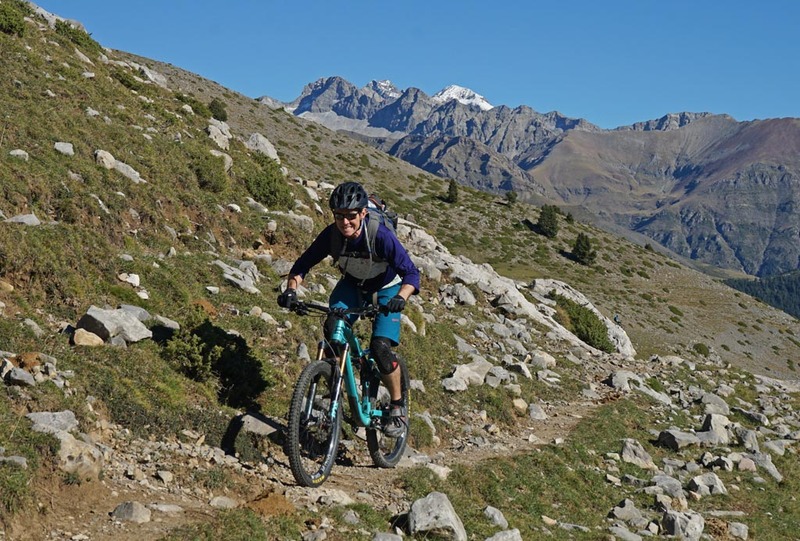 The 3000m+ peaks of the Pyrenees are in the background. The Brits Mark and Matt pedaling. Steve rocking on. Clear skies to our west and indeed, all around. Then we went down just a bit. Before the real climbing began. It’s always funny how people react to seeing bikes in strange places. 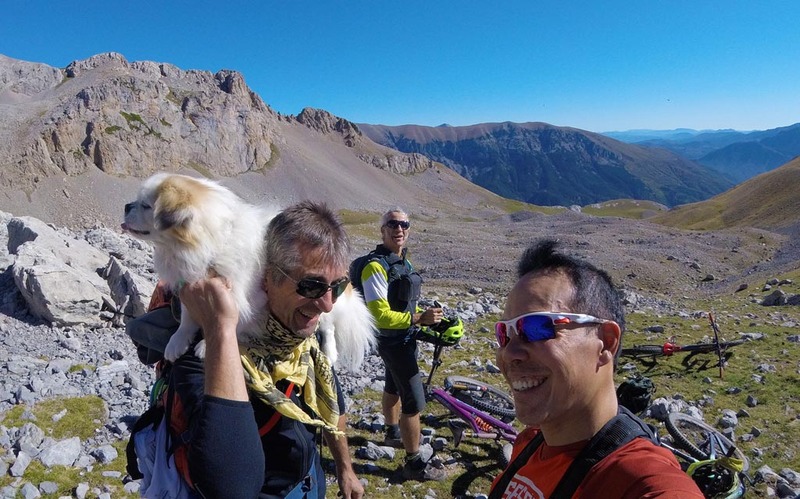 We were warned by Doug that the pass just below Cotiella was usually quite windy, and not to mess around. At the pass, we were greeted by views that went on forever, with nothing but sunshine and good cheer well into France to our north. 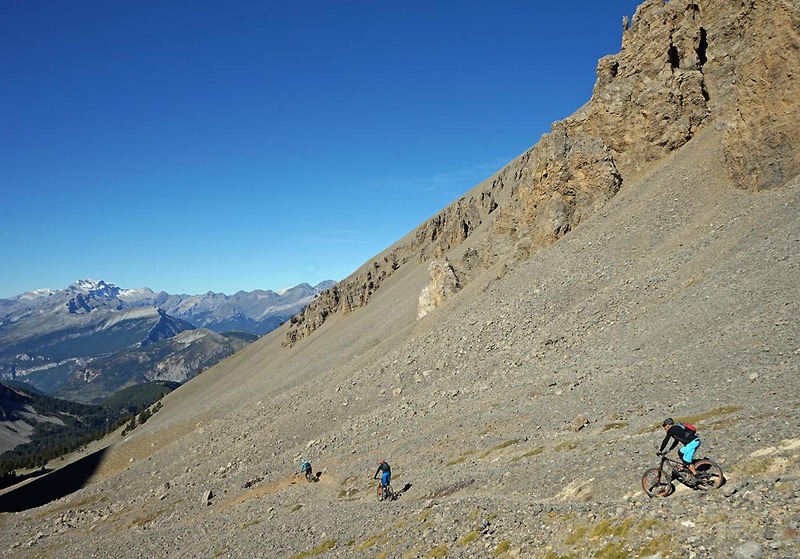 Unfortunately, there was no alpine restaurant with beer, but the upshot was the lack of other people on the trails. The lack of crowds allowed us to blast down the trail. 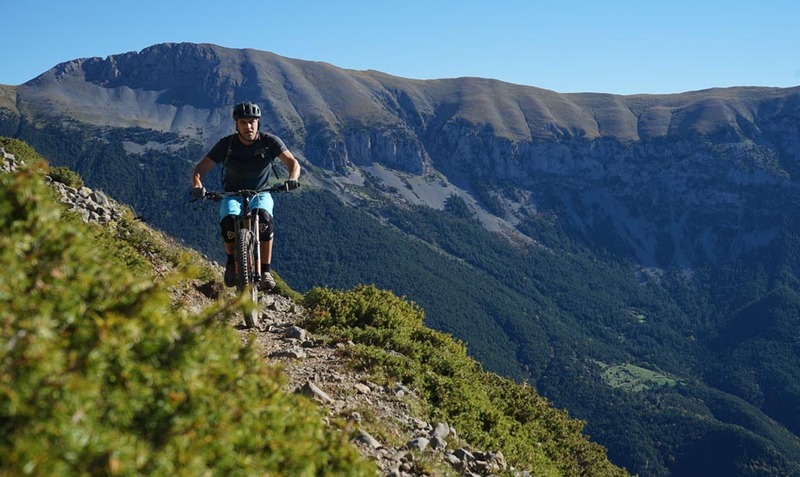 Cotiella is located on the dividing line between the counties of Ribagorza where Benasque is located, and Sobrarbe where Ainsa is situated. 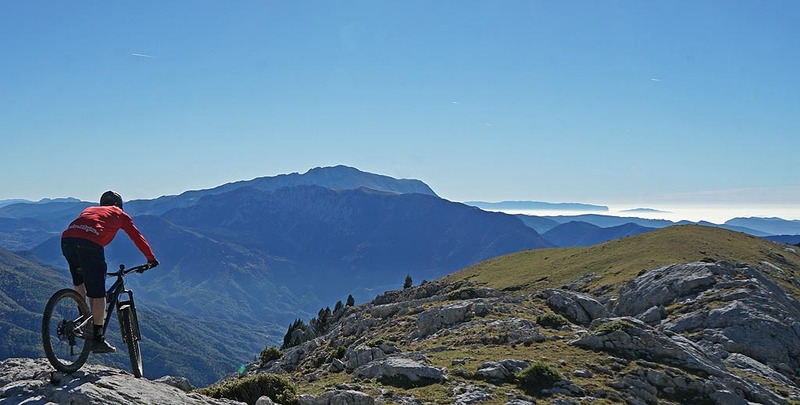 The trail descending from Cotiella itself is a mountaineering and hiking access route. 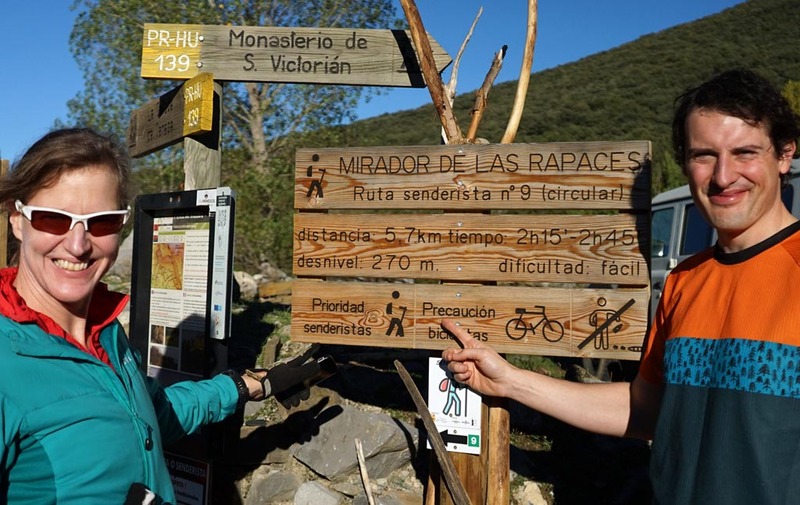 Of course, if we had encountered people we would have respected their right of way, but we saw no one until we got to a beautiful alpine lake, Ibon de Plan, at 1910m. 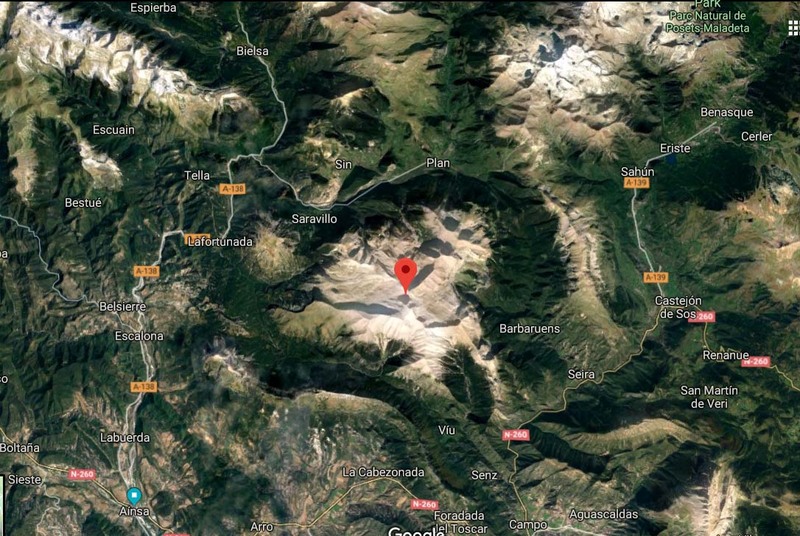 Ibon de Plan is close to an alpine refugio and is easily accessed from a gravel road that bisects the Grand Ruta GR 15 trail as it continues to the valley at Saravillo. 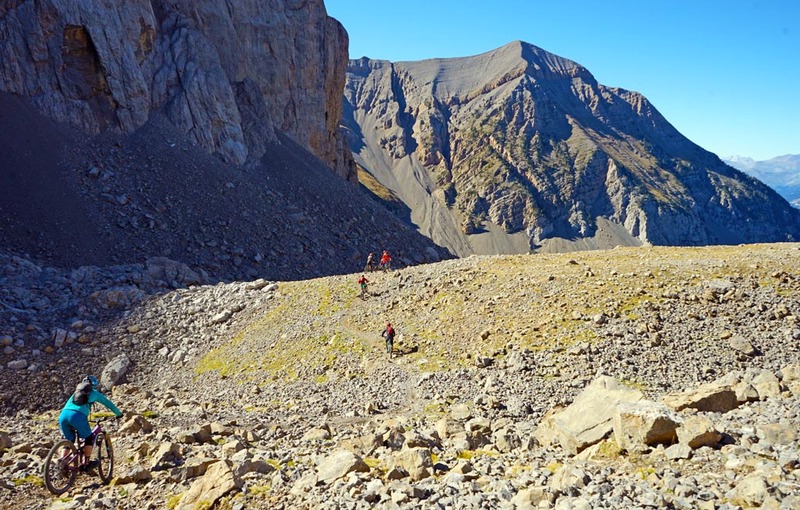 The entire descent is natural, which is to say it’s rocky, technical, and has lots of places to eat caca de la vaca! 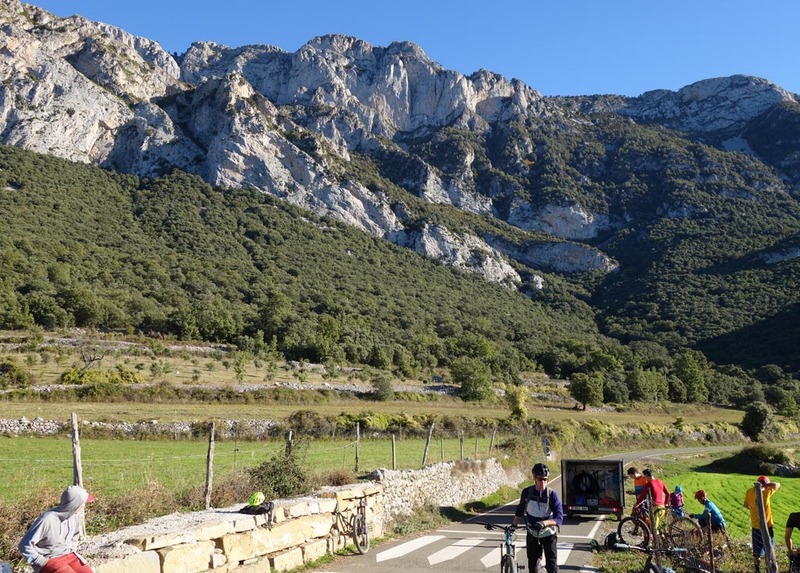 We governed our speed accordingly and tried to remember that rocks in the Pyrenees are sharp and tend to cause flats. It was a long, beautiful ride. 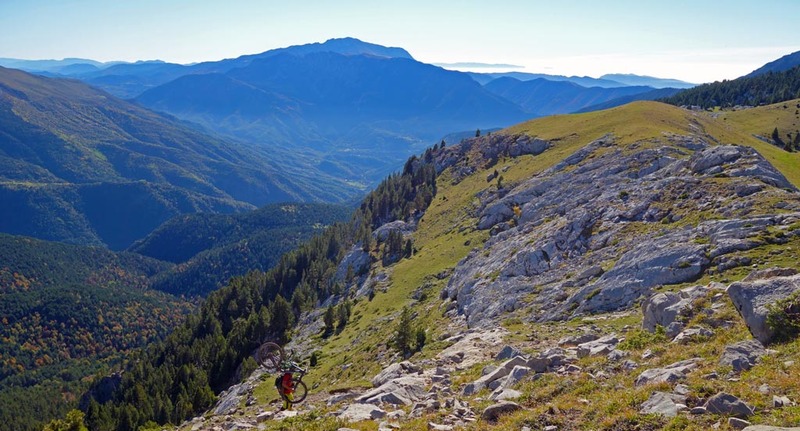 Descent from the top of Cotiella. Photo by Doug McDonald. Shar and the rest of the group picking their way through the boulder field. Group shot! Paul, Joel, Ken, Rob, Lee, Finn, Sharon, Doug, Mark, Steve, Raymond, Matt, Nick, Mark, and Antonio. Ibon de Plan is a beautiful lake. Riding away from Ibon de Plan. Photo by Doug McDonald. Regrouping before the main and final descent. 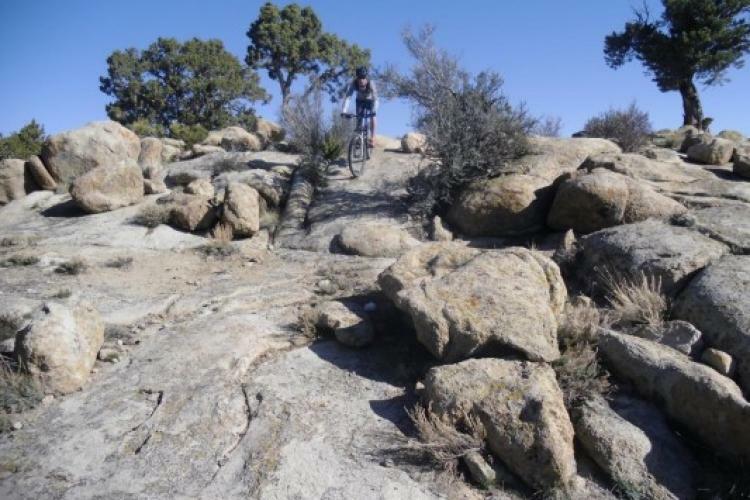 Then we went down fast, on rocky, flat-inducing trails. 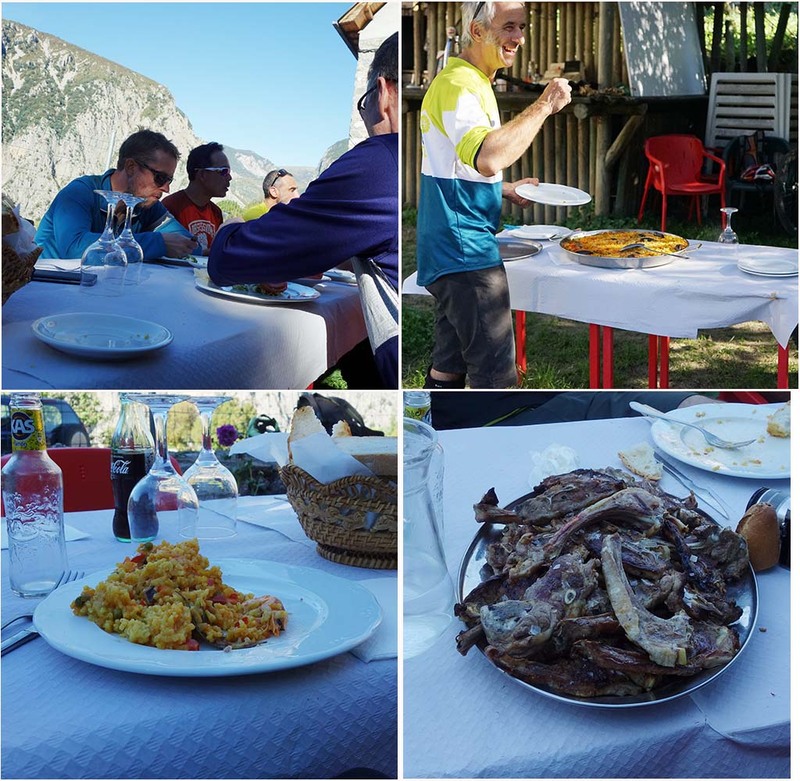 One of the defining characteristics of BasqueMTB trips was the ridiculously high quality and quantity of food. An amazingly hearty and frankly massive lunch of pasta carbonara, paella, chicken, Lamb ribs, Sausages, Beer and Coffee left all of us with the meat sweats. Luckily we had a good half hour to recuperate before another late afternoon ride. An amazing lunch at 3pm. 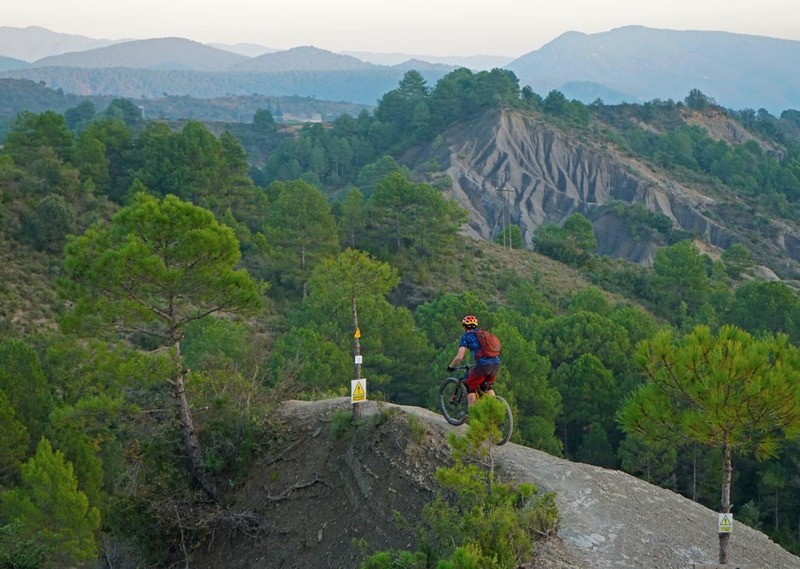 It’s the Paleo-Aragon diet of pasta, paella, chicken, lamb, sausages, beer, and coffee. 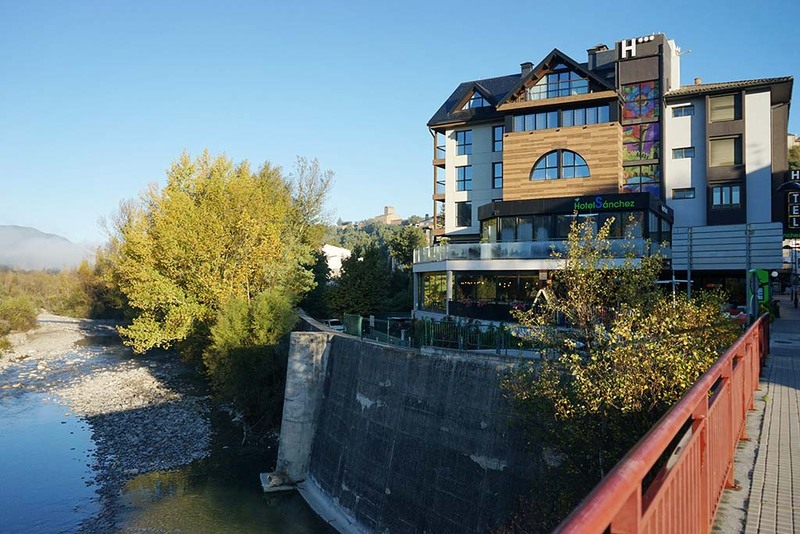 We stayed in Ainsa at the Hotel Sanchez where they serve Tronzadora Beer. 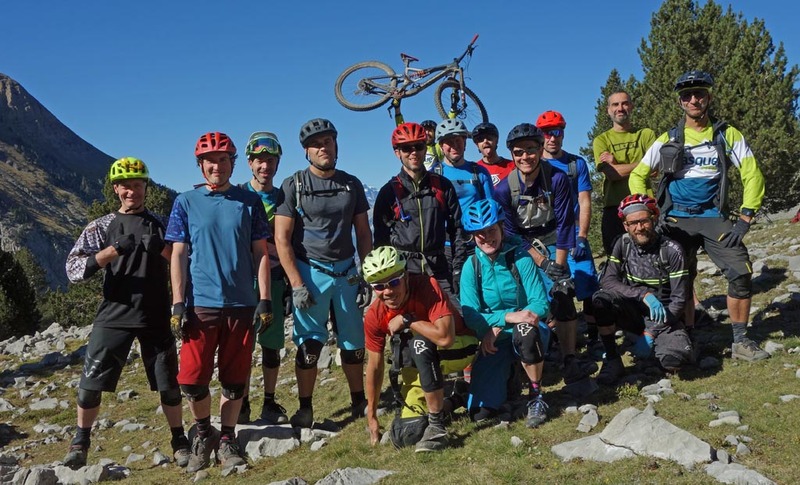 Beer proceeds support the Zona Zero Pirineos, the primary volunteer trail maintenance group taking care of trails in Ainsa, a cause we can get behind! Wayne on the photo-op spot. 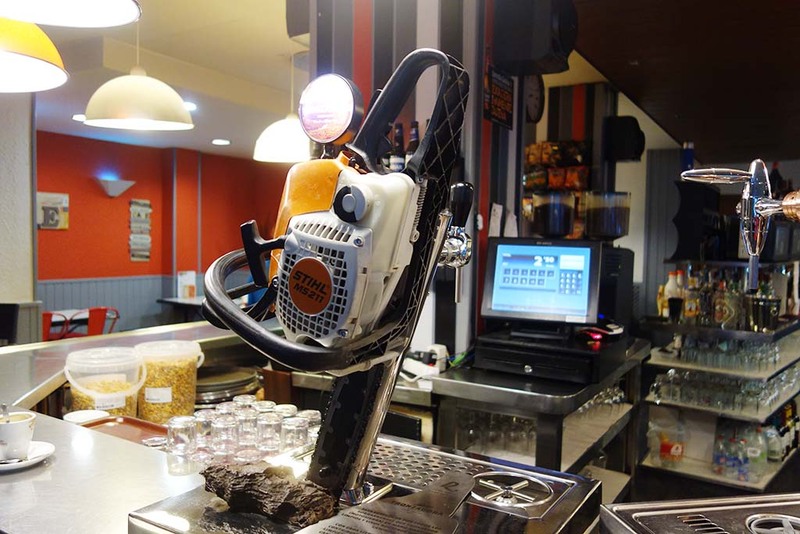 Hotel Sanchez serves Cerveca Tronzadora, which we had to drink to support trail maintenance! Our elevation profile for the day. 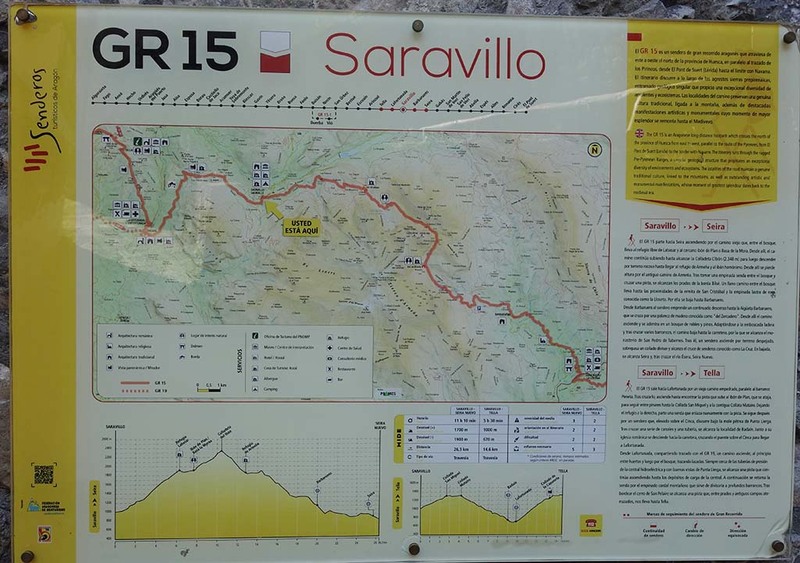 The first part of the day included Cotiella and the Gran Ruta descent to Saravillo. 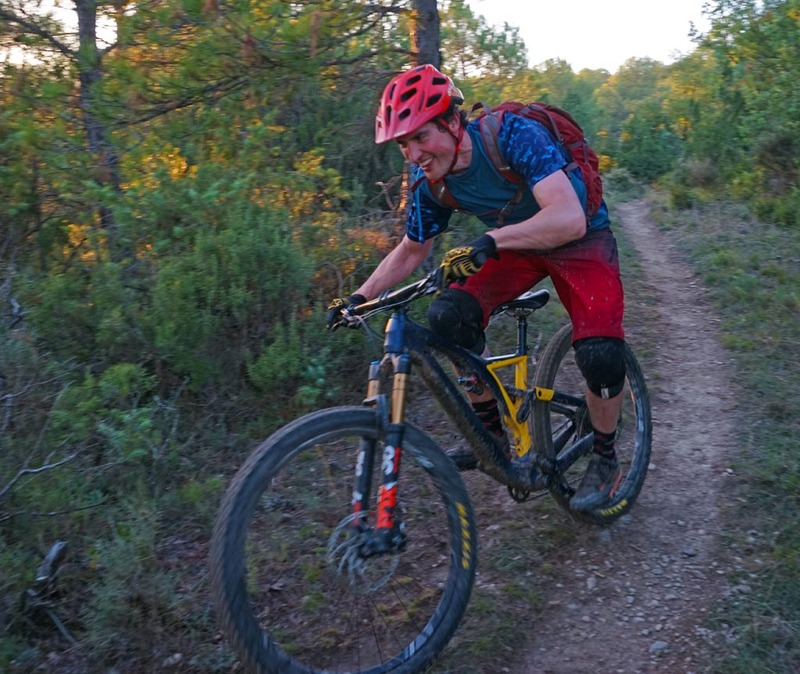 The second part was an Ainsa evening ride. Day four was said to make or break riders on these multi-day trips. 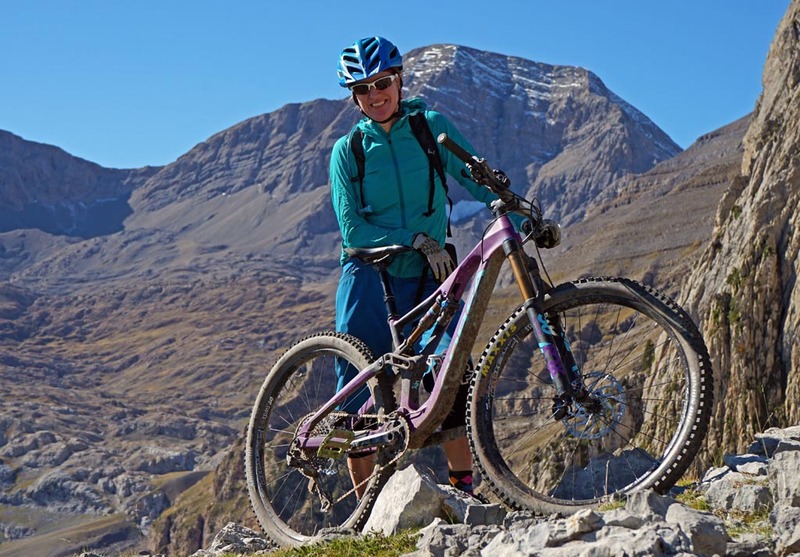 With the amazing weather, great riding partners, and these amazing Orbea Rallon 29er wonder bikes, getting out was easy for us. 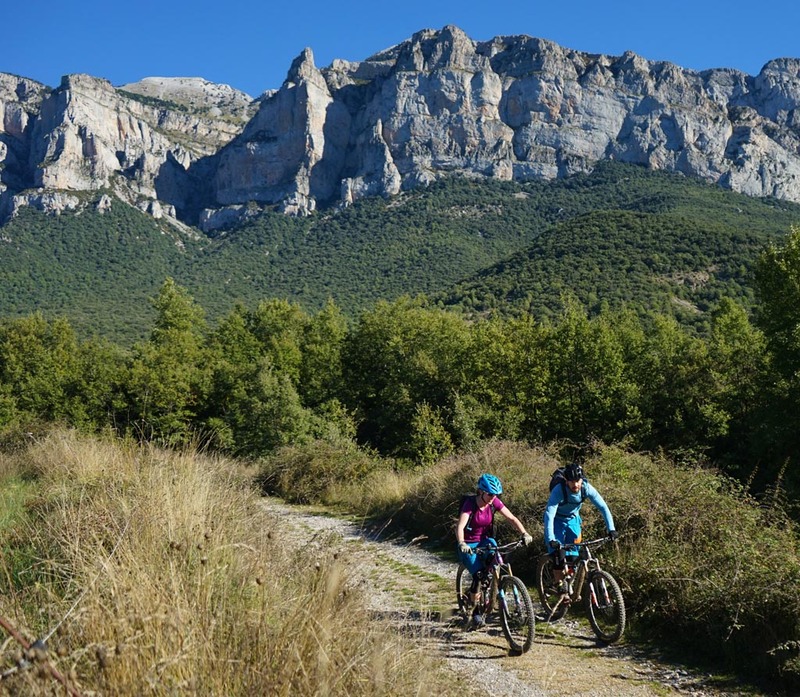 There are a lot of trails in Ainsa and the surrounding area, and there are many different ways to connect them. 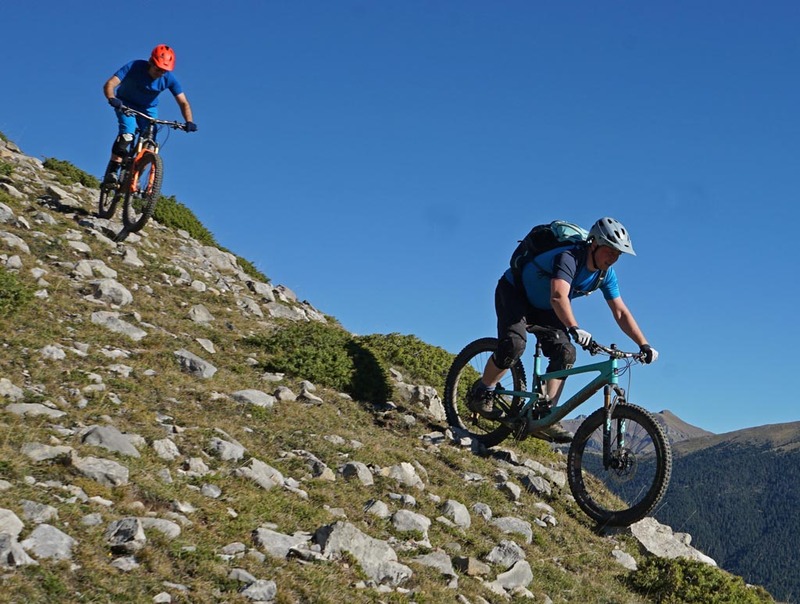 Having guides allowed us to make the most of the descents. The massive breakfast at Hotel Sanchez. 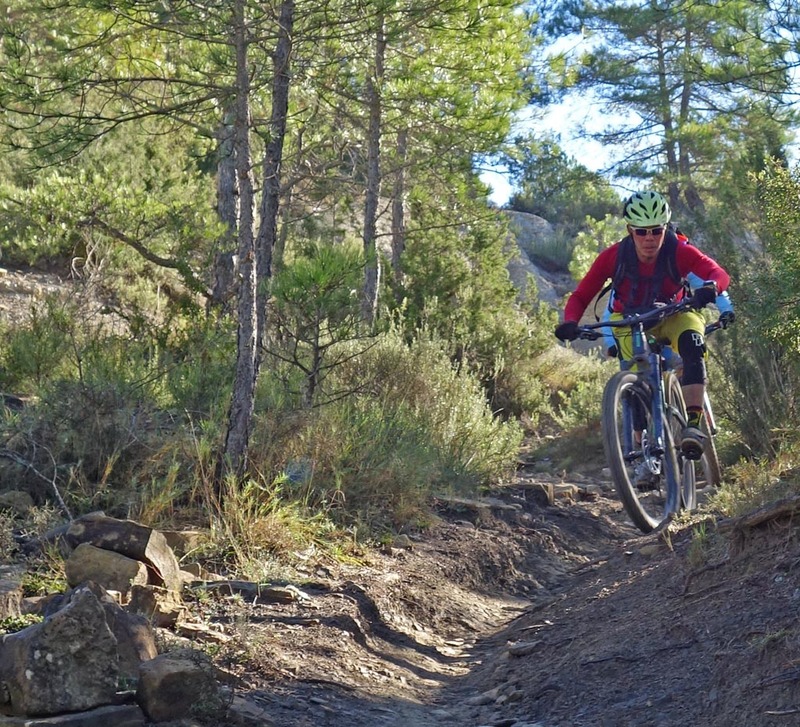 Our day of riding in Ainsa was characterized by uplifts interspersed with pedaling. 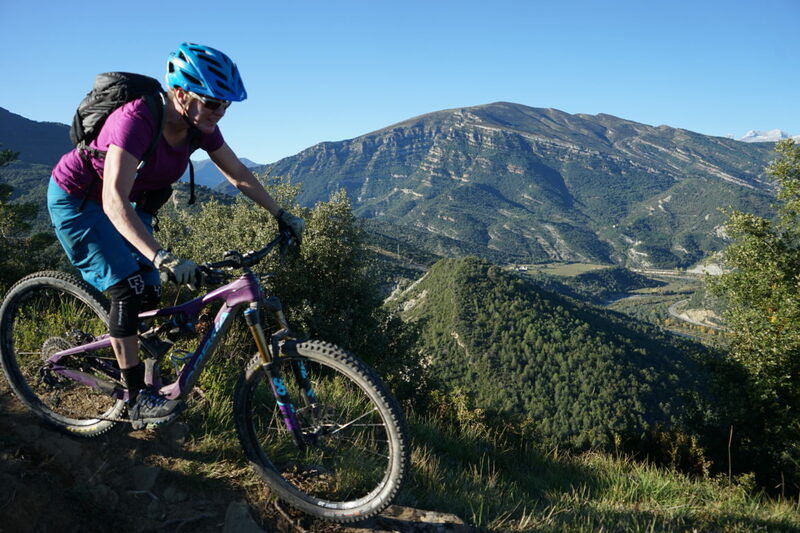 All in all, we had 2400m of descending on a variety of trails covering a lot of ground. 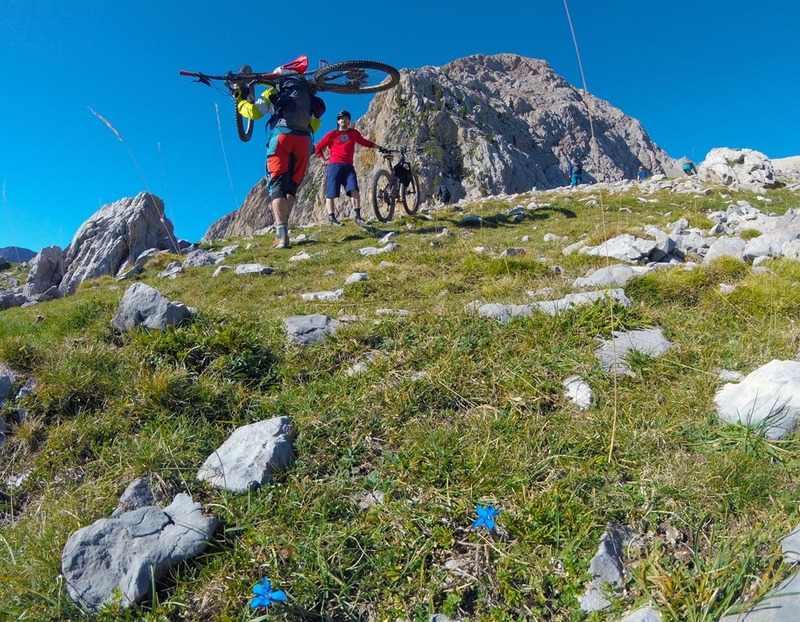 Some of the trails were in the EWS race. 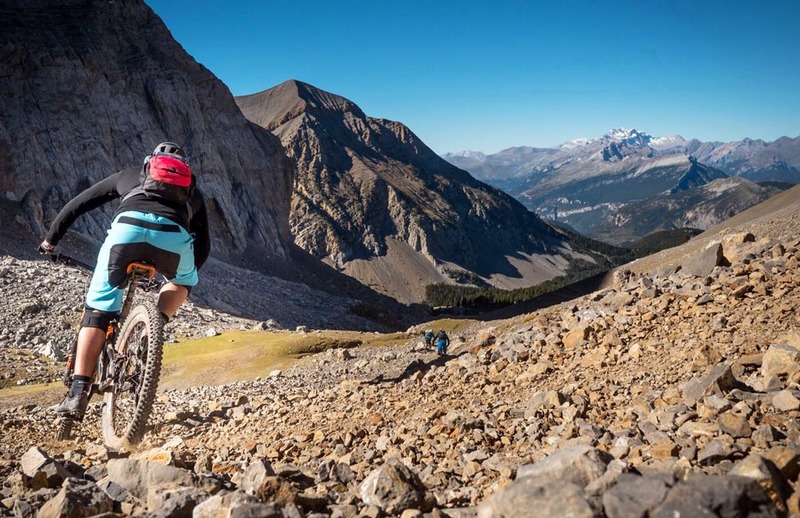 Some are local trails. 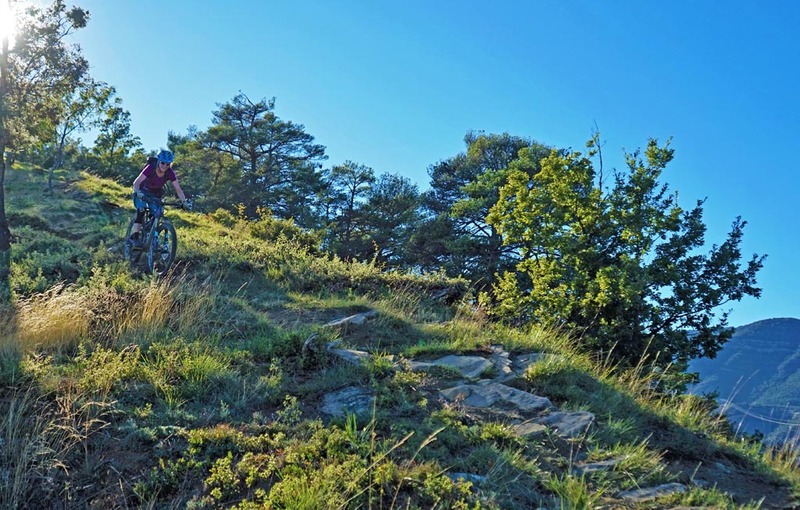 Many are linkups on routes designed by BasqueMTB with the help of the local Zona Zero trail organization. 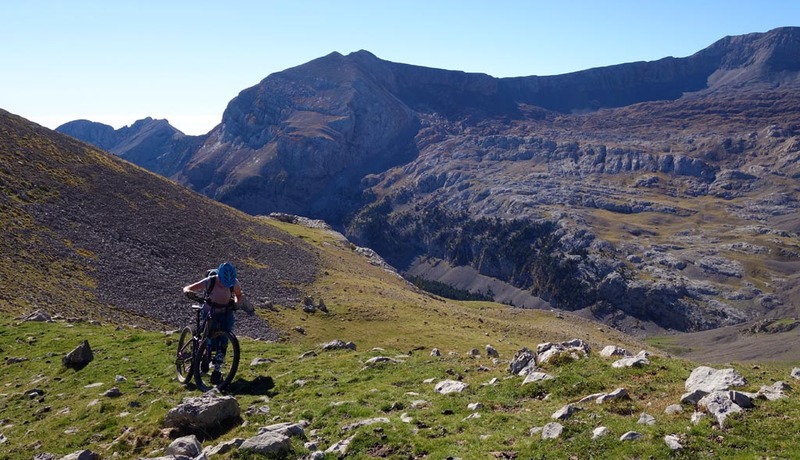 Our rides were dominated by views of the 2295m limestone massif atop La Pena Montanesa, though the trails we rode never made it into the alpine. 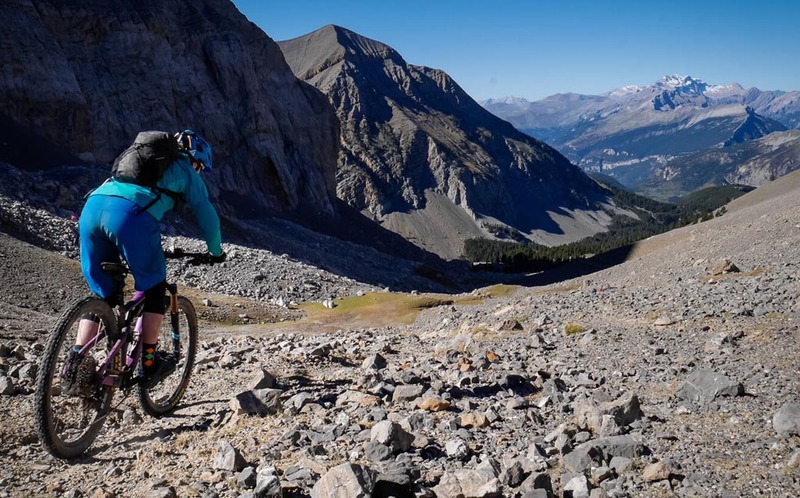 We got extremely lucky with weather and trail conditions and took full advantage by riding till our arms and legs cramped. 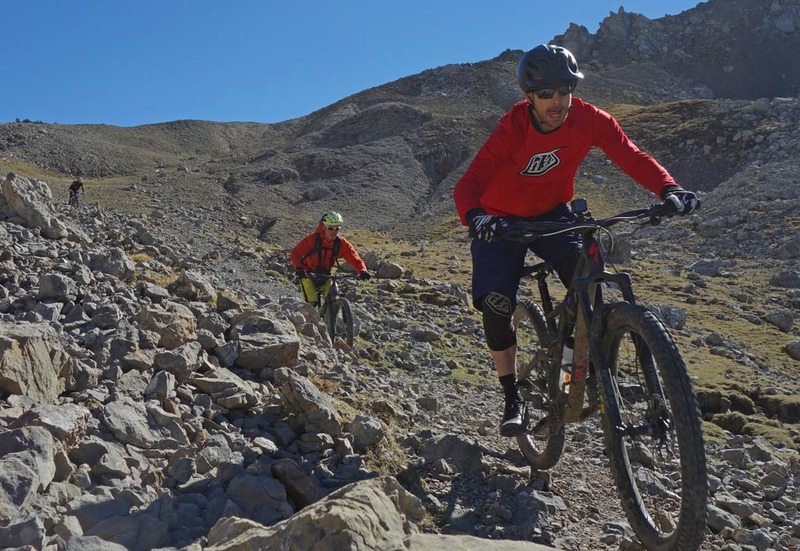 We did laps on El Cantone to Maxi Avalanche, Cuello d’os Muertos, El Cerro de la Cuesta, and Senda Precosta. Where we are Senderistas! Sharon and Joel. 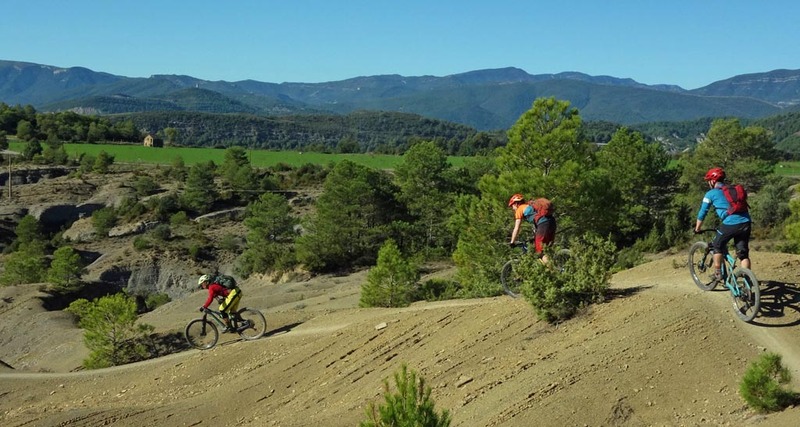 Open riding on sandy soil. 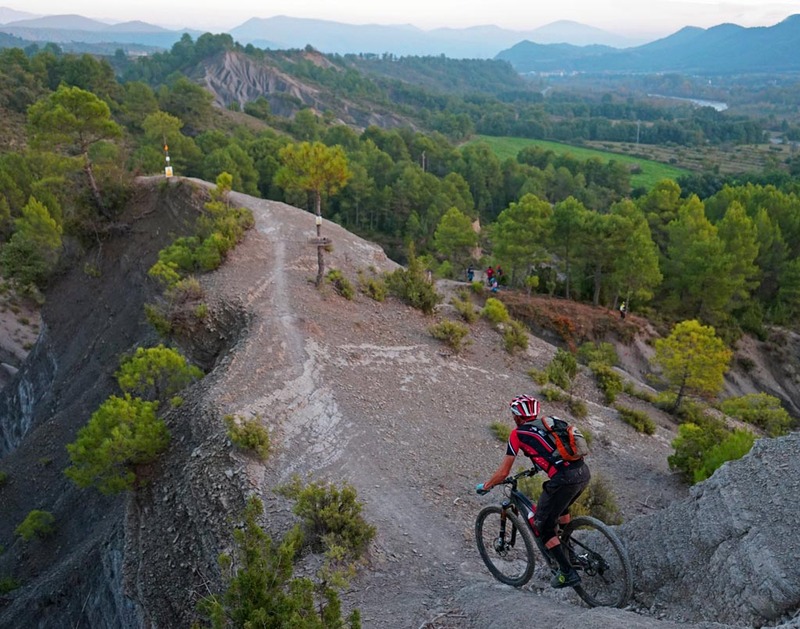 Ainsa is the natural gateway to the Pyrenees from the more inhabited southern regions down in the foothills. 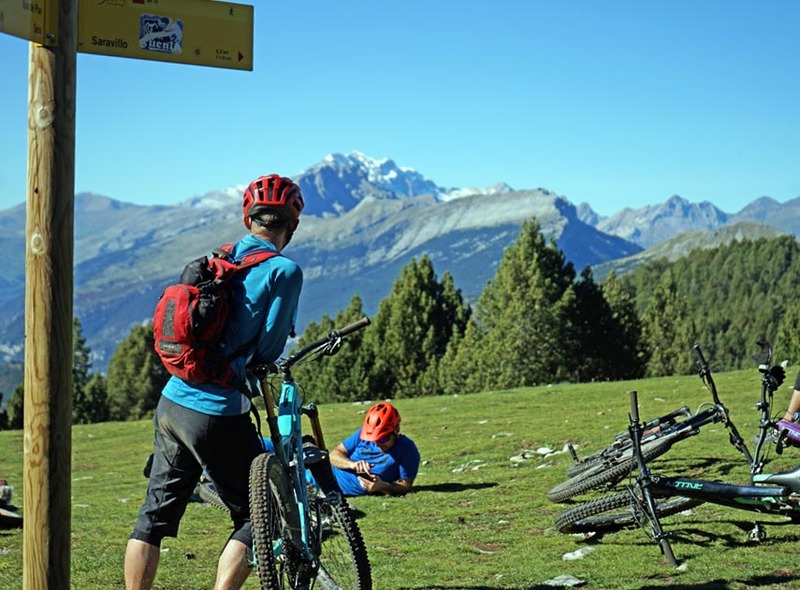 Its reputation as one of the best areas in Spain for biking generally and for mountain biking, in particular, is due in large part to the weather, with more than 300 sunny days a year. 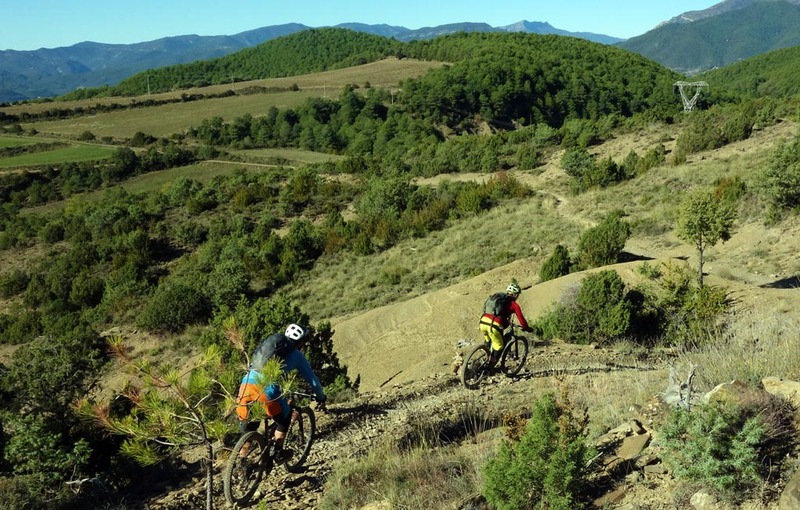 Indeed the weather is so good that BasqueMTB runs dedicated enduro Ainsa weeks in the winter. 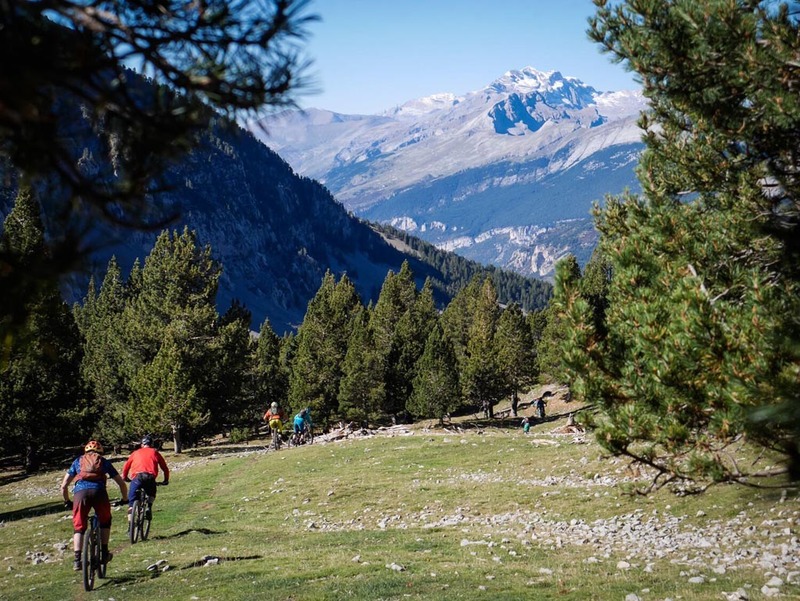 Zona Zero Pirineos is the locals’ heart and soul. 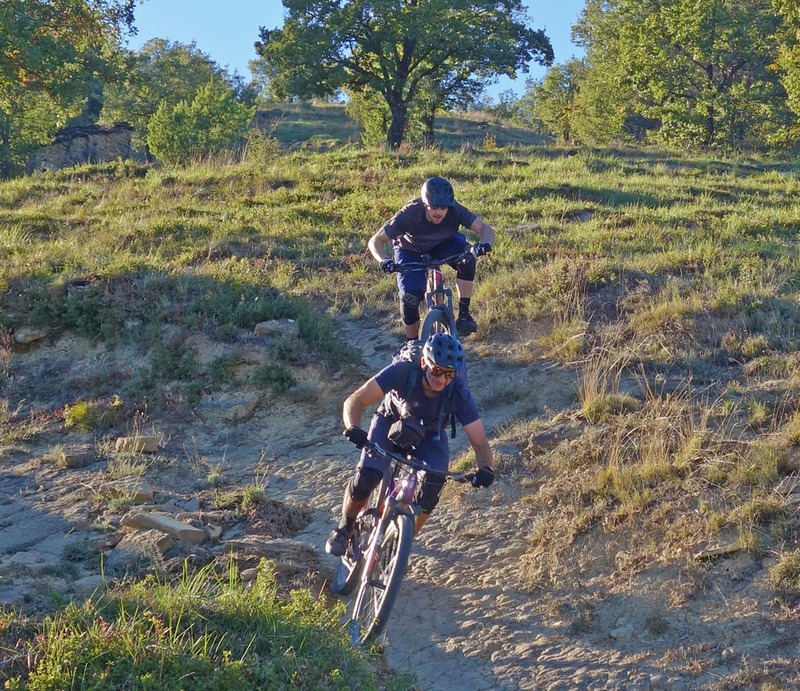 The collective was born from the desire of a few District of Sobrabe volunteers to recover an existing but abandoned and unmaintained network of miles and miles of traditional trails. 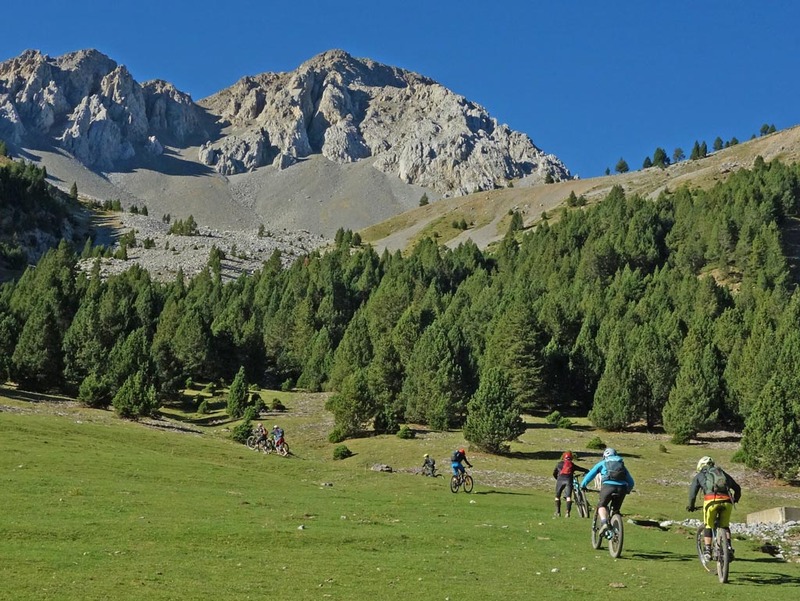 The Pyrenees lost many residents in the 70s and 80s as jobs moved into Spanish cities. As a result, old trails between towns and villages became overgrown and underused. 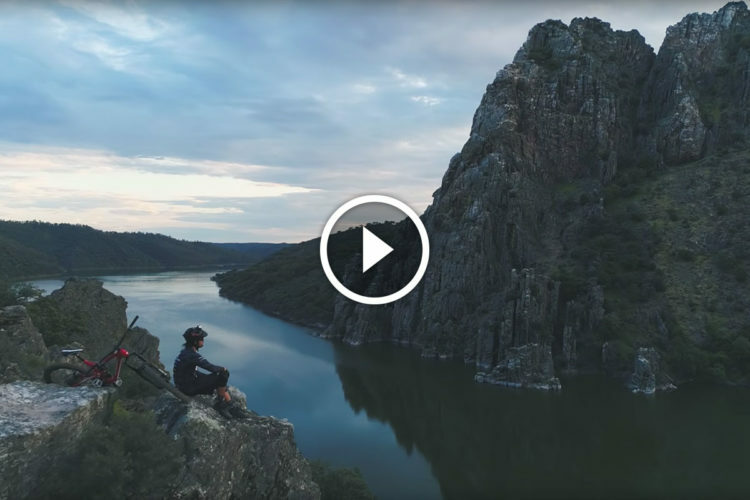 These local volunteers decided to create value in this massive and underutilized trail network by promoting sustainable economic development oriented toward active outdoor tourism. At first, hikers came. 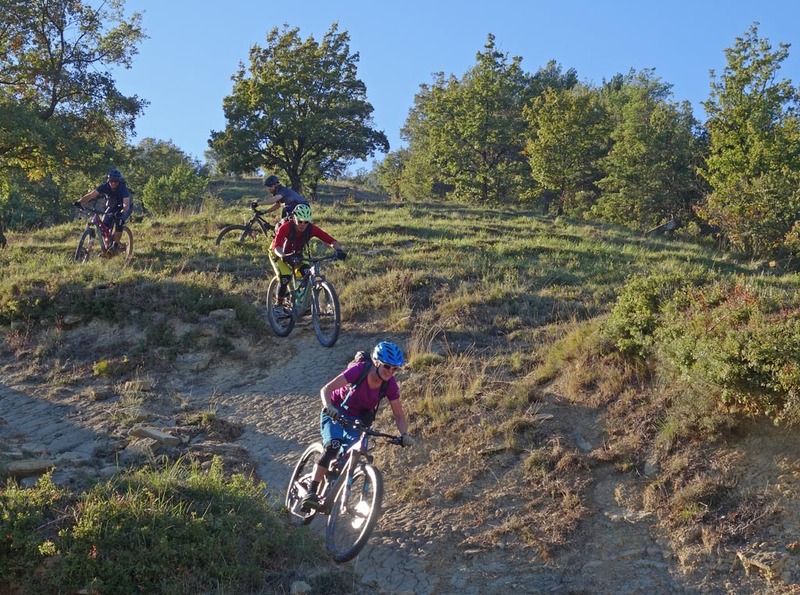 Then mountain bikers. 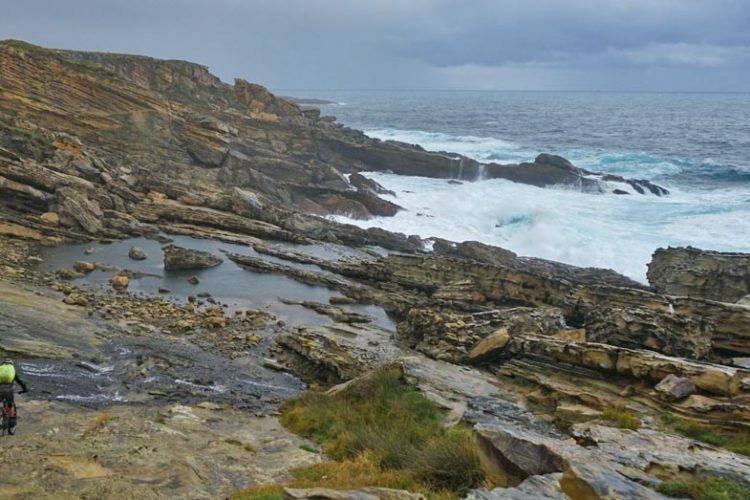 Then later, the EWS came, which really put Ainsa and the region on the map. 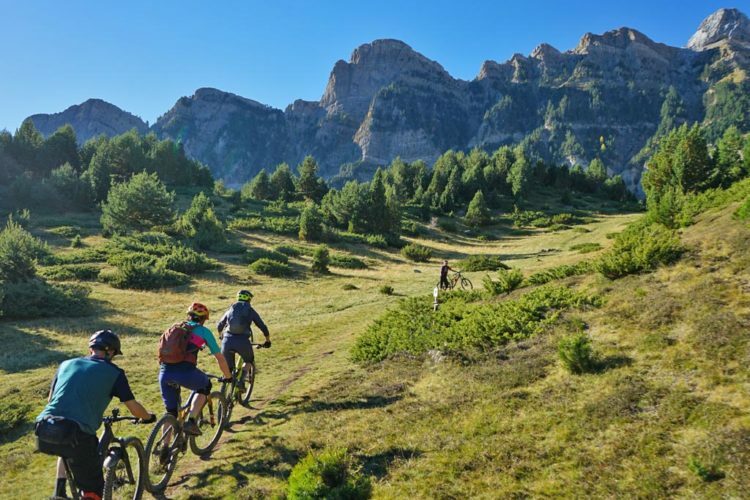 Now Zona Zero is an organization of over one hundred entities including hotels, bike rental companies, shops, ski lifts, MTB guides, and massage therapists, all of whom provide services for outdoor activities. In turn, tourism has transformed the region, bringing year-round jobs and rejuvenating the towns and trails. It is truly an economic success story. On a ridge with more amazing views. We continued on with Steve chasing down Antonio. Cool, my Icebreaker shirt matches my Orbea Rallon! 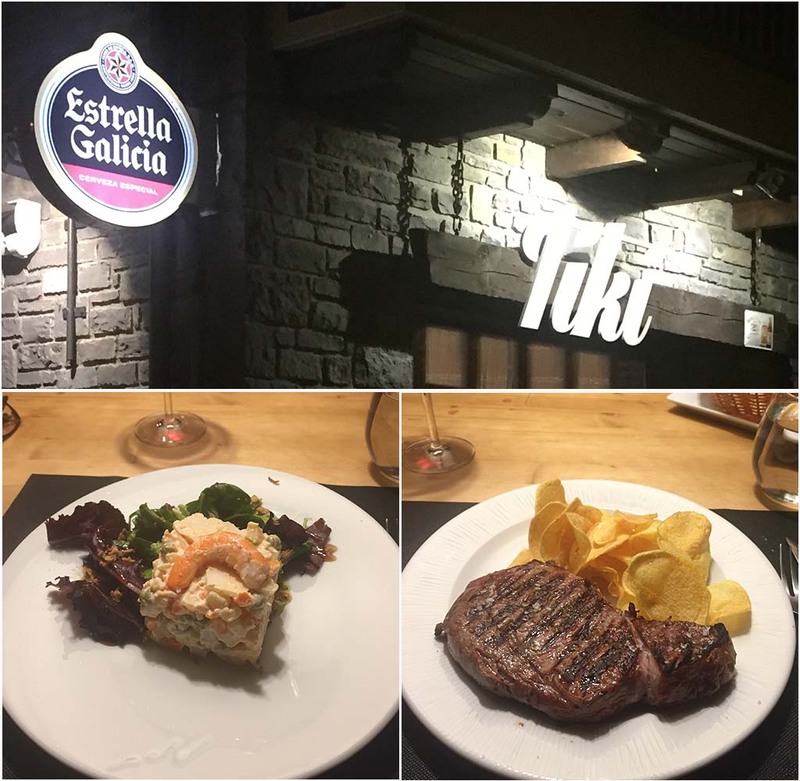 Dinner at the Tiki restaurant in Biescas. Spaniards like their meat. 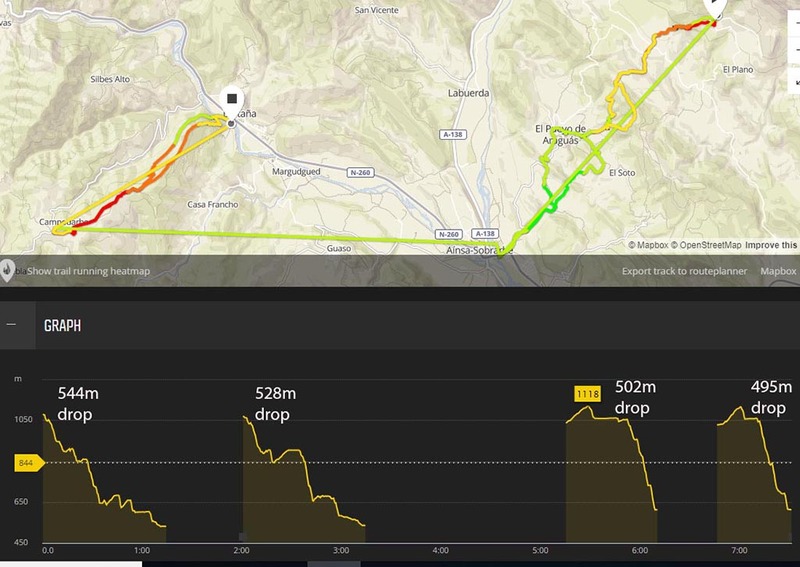 Zona Zero map and elevation profile for the day. 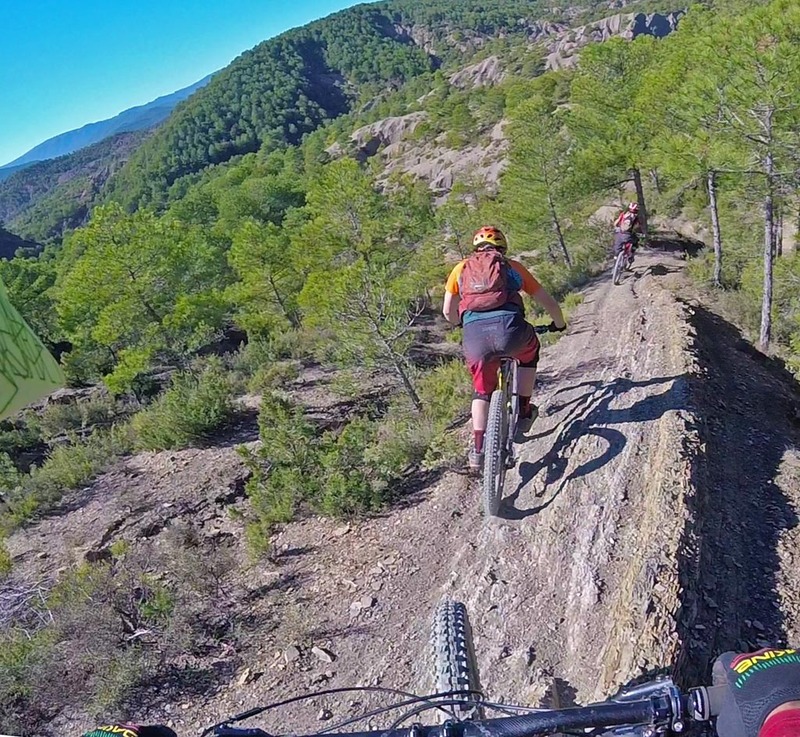 Stay tuned for part 3 as we ride Biescas.